As part of a routine, every Sunday I will read “The Edge” magazine. Last weekend was no exception. Front page this week reads “China Aviation Oil’s Big Year Ahead!” Being bullish about China long term future, the article aroused my interest. I began researching about the company. Below is a review of my research. China Aviation Oil (Singapore) Corporation Ltd (SGX:G92.SI) "CAO" is the largest physical jet fuel trader in the Asia Pacific region and the sole supplier of imported jet fuel to China's civil aviation industry. Listed on SGX mainboard in 2001, CAO is backed by China large state-owned enterprise China National Aviation Fuel Group Corporation ("CNAF"). CNAF holds 51% stake in CAO, while BP investments Asia Ltd, a subsidiary of oil major BP, holds 20% stake. CAO's key businesses include 1) Jet fuel supply and trading – core; 2) Trading of other oil products; 3) Investments in oil-related assets. For more of CAO businesses, please refer here. Dividend 2c in 2013, i.e. 2.84% yield at current price of 0.705. Healthy net cash of US$55.8mil as of End 3Q14. Note: Expect 4Q14 results could be weak like 3Q14. Expected PE can be around 9 in 2014. CAO was ranked 36th out of 664 companies listed on SGX, putting CAO in the top 6% of Singapore-listed companies in terms of corporate governance and transparency. Note: Always be skeptical about awards! Nevertheless the above awards probably show CAO is a probably one of the better S-chips? China jet fuel consumption grew >10% last year and expected to maintain growth rate this year. By 2020, jet fuel consumption is forecast to hit 39mil tonnes. We know that China has been building high-speed railways. To some, air travel demand will be stifled. On the other hand, it will make it more convenient to reach major international airports. According to Airbus forecast, China will need 5,363 new passenger aircraft and freighters from 2014 to 2033, accounting for 17% of global demand. The country will also have more domestic air traffic than any other country within 10 years. And, passenger number are expected to grow by 7.1% annually over the next 20 years. 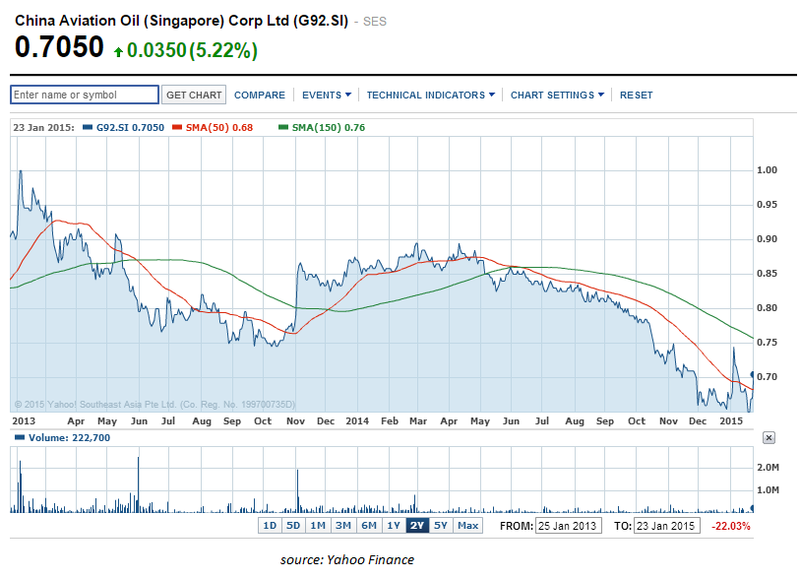 Due to the oil price slump, CAO share price also dropped more than 20% in the past year. However unlike upstream oil producers who could face reduced profitability, CAO is likely to see earnings recovery this year, according to CAO CEO. More than a month ago, I blogged about Mark Mobius view on Oil stocks. Refer here. Mark Mobius cited that lower oil is bad for the exploration side, but for the distribution side of oil companies its good. CAO PB is at 0.82x respectively. Competitor Brightoil Petroleum base in HK which operates oil fields and supplies bunker to ships, is trading at PB 2.09x. New York listed World Fuel Services, the global leader in fuel logistics, is trading at PB 1.88x. Today China accounts for only 51% of the company’s revenue, down from 88% in 2011. In 2012, CAO acquired Hong Kong and North American Fuel Corp (NAFCO) from its parent. Today, NAFCO has jet fuel contracts supplying to major Chinese airlines at US, London, Paris, Madrid, Amsterdam, Frankfurt and Geneva airports. NAFCO also has contracts with Emirates and Taiwan China Airlines and EVA Air. In 2013, it won Hong Kong airport third aircraft refueling license in joint venture with three partners. Its overseas jet fuel is projected to grow at a rate of 20% annually. With Singapore Terminal 4 upcoming, CAO also see Singapore as a potential new market. CAO owned 26% stake in Oilhub Korea Yeosu (OKYC) which owns and oil storage terminal in Korea. The launch of the operation was delayed due to problems in the last two years. Now with oil price depressed, demand for storage of oil is so high. By end of Nov, 81% of OKYC’s capacity was rented out. In its pipeline plans, CAO wanted to expand its operations into supply of fuel oil to ships in Singapore and China. Currently, CAO is renting fuel oil storage facilities in Singapore, but has plans to acquire or build its own facilities in future. CAO is also constantly exploring new products such as aviation biofuels and LNG. Last year it become the sole importer of Avgas, or aviation gas, into China. This is potentially big market because business jets which consumes aviation gas are going to be more prevalent in China. YTD 3Q14, Revenue rise 13.5% yoy to US$12.7b, BUT Earnings decline >21% yoy to US$44.7mil. Much of the weakness come from 3Q14 with >66.5% decline in earnings yoy to US$7.3mil. On Jan 8, CAO warned that 4Q14 performance will be similarly affected. The decline in earnings in 2014 is due to the volatility and difficulty in trading environment. Amid the challenging operating environment, many players reduced their trading activities or stayed on the sidelines resulting in poor liquidity in the fuel oil market. However CAO think that weaker players were already pushed to the wall and squeeze out, and this year will spell earnings recovery for CAO. The global economic recovery remains uncertain. Exacerbated by speculative activities, oil prices are expected to remain volatile and this may pose greater challenges to the Group in terms of trading risk exposures. The slowdown of China’s economic growth is inevitable and with the increase of China’s domestic refining capacity, a corresponding slowing down of demand for jet fuel import is to be expected. This would invariably pose challenges to our core jet fuel business. Domestic oil refiners in China produce more jet fuels than the country consume. Due to this jet fuel sale in domestic Chinese market may be affected. However for international flights, only bonded fuel can be use. There can be a risk that this ruling may change weighing down CAO share price. 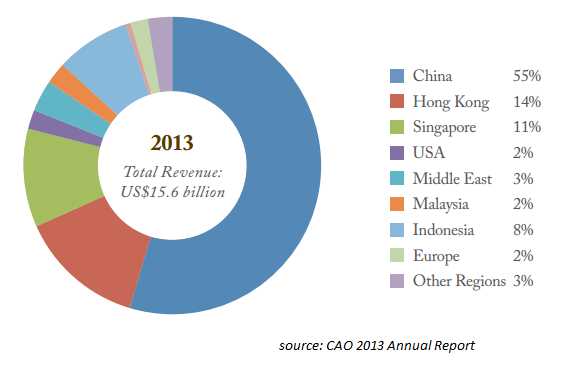 This is also one reason why CAO is diversifying its business overseas. As a frequent traveler within China, one thing I hate most is taking internal flights. Planes are practically always at full capacity, so are runways or air traffic, resulting in frequent flight delays. I been to China’s three largest international airport - Bejing Capital, Shanghai Pudong and Guangzhou Baiyun. It’s always “People Mountain People Sea” meaning so many people). During Chinese New Year peak period from 4 Feb to 15 Mar, Chinese passengers are expected to make 2.8 billion trips on China’s public transport network – 100 million more than last year. Among the forecasted 2.8 billion trips, 2.42 billion would be by public road transport, making up the bulk of the trips. Only about 47.5 million trip will be by air, indicating the potential of growth in this sector. After evaluating all the pros and cons, and taking into consideration my bull’s view on China, proposition for myself…. Long CAO! I bought 10 lots for now at 0.71. CapitaRetail China Trust to Continue Thriving in a Pessimistic China Economic Outlook? now then realise it become so cheap now. Over long term, I still like to think of oil as a scarce commodity n China as the country of the future. Just personnel views!